6 THE FOLLOWING ARTICLE IS REPRINTED IN IT"S ENTIRITY. Taken from [[underline]]LA GENTE[[end underline]], UCLA, newspaper. 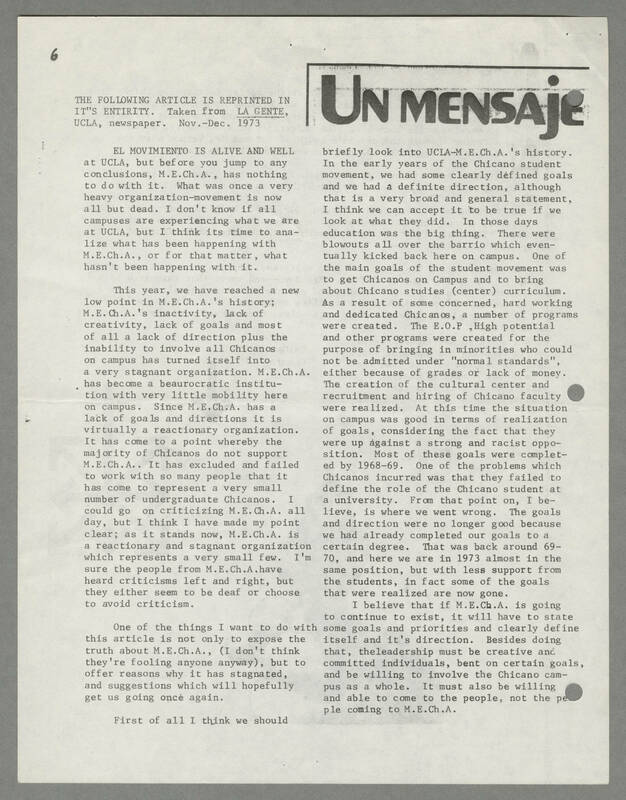 Nov.-Dec. 1973 UN MENSAJE EL MOVIMIENTO IS ALIVE AND WELL at UCLA, but before you jump to any conclusions, M.E.Ch.A., has nothing to do with it. What was once a very heavy organization-movement is now all but dead. I don't know if all campuses are experiencing what we are at UCLA, but ti think its time to analize what has been happening with M.E.Ch.A., or for that matter, what hasn't been happening with it. This year we have reached a new low point in M.E.Ch.A. 's history; M.E.Ch.A. 's inactivity, lack of goals and most of all a lack of direction plus the inability to involve all Chicanos on campus has turned itself into a very stagnant organization. M.E.Ch.A. has become a beaurocratic institution with very little mobility here on campus. Since M.E.Ch.A. has a lack of goals and directions it is virtually a reactionary organization. It has come to a point whereby the majority of Chicanos do not support M.E.Ch.A.. It has excluded and failed to work with so many people that it has become to represent a very small number of undergraduate Chicanos. I could go on criticizing M.E.Ch.A. all day, but I think I have made my point clear; as it stands now, M.E.Ch.A. is a reactionary and stagnant organization which represents a very small few. I'm sure the people from M.E.Ch.A.have heard criticisms left and right, but they either seem to be deaf or choose to avoid criticism. One of the things I want to do with this article is not only to expose the truth about M.E.Ch.A., (I don't think they're fooling anyone anyway), but to offer reasons why it has stagnated, and suggestions which will hopefully get us going once again. First of all I think we should briefly look into UCLA-M.E.Ch.A. 's history. In the early years of the Chicano student movement, we had some clearly defined goals and we had a definite direction, although that is a very broad and general statement, I think we can accept it to be true if we look at what they did. In those days education was the big thing. There were blowouts all over the barrio which eventually kicked back here on campus. One of the main goals of the student movement was to get Chicanos on Campus and to bring about Chicano studies (center) curriculum. As a result some concerned, hard working and dedicated Chicanos, a number of programs were created. The E.O.P ,High potential and other programs were created for the purpose of bringing in minorities who could not be admitted under "normal standards", either because of grades or lack of money. The creation of the cultural center and recruitment and hiring of Chicano faculty were realized. AT this time the situation on campus was good in terms of realization of goals, considering the fact that they were up against a strong and racist opposition. Most of these goals were completed by 1968-69. One of the problems which Chicanos incurred was that they failed to define the role of the Chicano student at a university. From that point on, I believe, is where we went wrong. The goals and direction were no longer good because we had already completed our goals to a certain degree. That was back around 69-70, and here we are in 1973 almost in the same position, but with less support from the students, in fact some of the goals that were realized are now gone. I believe that if M.E.Ch.A. is going to continue to exist, it will have to state some goals and priorities and clearly define itself and it's direction. Besides doing that, theleadership must be creative and committed individuals, bent on certain goals, and be willing to involve the Chicano campus as a whole. It must also be willing and able to come to the people, not the people coming to M.E.Ch.A.